The goldenrain tree, or koelreuteria paniculata, is a popular ornamental tree due to its aesthetically pleasing flowering habit and unique seed pods. Goldenrain trees produce a 12- to 15-inch long cluster of yellow flowers in spring. These flowers eventually fall from the tree in a shower of yellow petals that give the tree its name. In summer, heart-shaped branches of papery seed pods form on the trees. These pods change from green to yellow and finally brown before breaking open and dispersing their seed. The numerous seeds produced by goldenrain trees have led some states to classify the tree as an invasive species. Time tree removal of goldenrain trees before the seed pods form on the tree. Cutting down a tree when the seed pods form will scatter the seed pods and lead to new trees sprouting. Hand-pull small goldenrain tree seedlings from the ground before they grow so large that you must cut them down. Look around the tree to make certain that there are no obstacles such as power lines that would prevent you from removing the tree yourself. If you spot power lines or other obstacles, have the tree removed professionally. Clear away brush, tree roots, stones or other objects that could trip you while you cut down the tree. 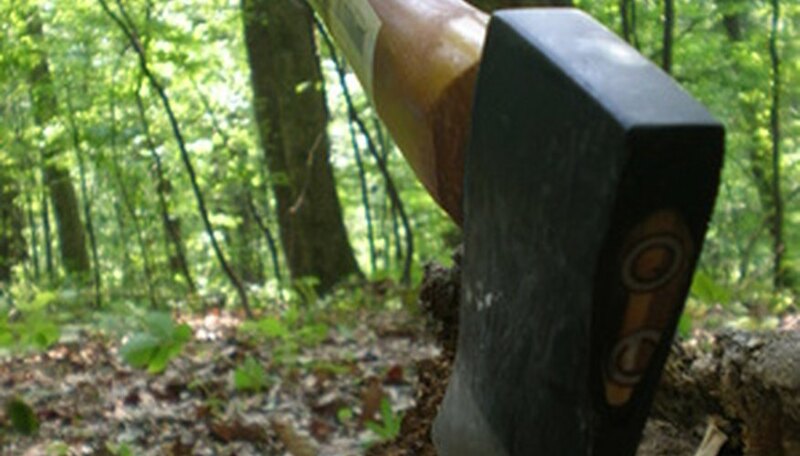 Cut down larger goldenrain trees with an axe or chain saw. Determine which direction that you want the tree to fall. Make a wedge-shaped cut, called an undercut low on the tree trunk and open in the direction you want the tree to fall. The cut should extend 1/3 of the way through the tree’s trunk. Then, make a back cut on the other side of the tree just slightly higher than the point of the undercut. This cut should extend 2/3 of the way through the tree. The tree will fall in the direction of the undercut. Back away from the tree while it falls to keep the tree from accidentally injuring you if it bounces or falls in an unpredictable way. Apply a chemical herbicide containing 100 percent triclopyr-amine within 1 minute of cutting down the tree. According to the University of Florida IFAS Extension’s center for Aquatic and Invasive plants, this solution will kill the stump of the goldenrain tree and prevent new trees from returning from the roots of the old tree.